Hi there and thanks for popping over for a visit! Are you having a good weekend? I'm enjoying some "me time" in my craft room today. I haven't been crafting as much as I have been organizing. My addiction with stamps and Copic markers has gotten a bit out of hand and I'm trying to come up with better storage options. Ah....the woes of an over-stocked crafter! I like to have little goodies on hand during the Christmas season for a quick little gift. It seems like I always need something for a teacher's gift or a get together or "just because". I think this little set fills that need perfectly! 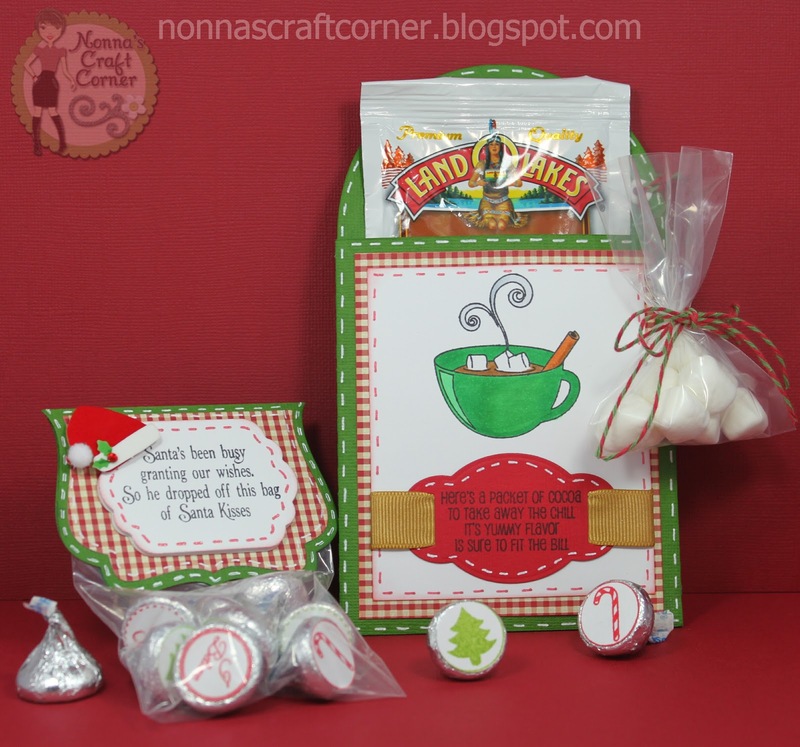 * I used the "Treat Pocket" file from the Silhouette Online Store for the Cocoa Holder. * The Mug and Sentiment are from the Jaded Blossom stamp set "Hot Cocoa"
* Red sentiment tag is from Spellbinders - "Ribbon Tag Trio"
* I used the Jaded Blossom die "Fancy Topper Die"
* Sentiment mat is Spellbinders - "Labels 11"
I'm pretty sure I will be making more of these fun sets to have on hand this year! This is just too cute!!! Its the perfect gift!!! Too cute and what a great gift idea for those unexpected gifts. Love the stamps and your coloring is superb. I love this!!! Sooo cute!!! The treat bag is my favorite!! Oh what a sweet project!!! This is such a fabulous Christmas gift. I am have to scraplift this! This is Adorable. I really love what you made her and Gorgeous coloring of that cup. LOVE it. Adorable! We had hot chocolate after my son's soccer tournament game (which they won!). It was so cold this morning!!! I have some copic markers - they have become my highlighters for the kids weekly school newsletters, haha. I'm terrible at stamping! I cheat with my silhouette sometimes when I need a sentiment for a card. You did great, this is such a cute little gift! Thanks for sharing! Those are really cute. Perfect for teachers and their aides. What a Lovely treat!Cute and yummy! Adorable gift set!! Love everything about this! Tanya ~ Too CUTE! Your coloring is just AMAZING!! I LOVE the little cocoa holder ~ CUTE idea!!! Well I can relate to being over stocked ~ just seems to catch up all the sudden! I hope the organizing is going great!!! Tonya, you really do make the cutest things! Such inspiration you are sharing with others. Thank you so much for sharing this--I've got some ideas in my head that I just cant wait to get started on! Thanks! Oh Tanya these are so cute, what a great gift idea! Ok I think every time I stop by I add something to my ever growing wish list. These JB stamps are fabulous! !